Paving Interlayers are engineered geotextile fabrics placed between layers of asphalt concrete (AC). 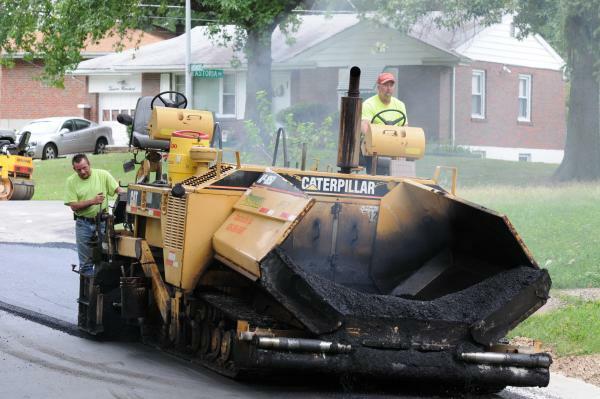 Since 1965, the Paving Interlayers have had an outstanding record of improving pavement performance while reducing maintenance and roadway life-cycle costs. Paving fabric systems are currently being used at a rate of over 15,000 equivalent lane miles per year in North America alone. Paving Interlayer Systems extend the life of new AC pavements and AC overlays. 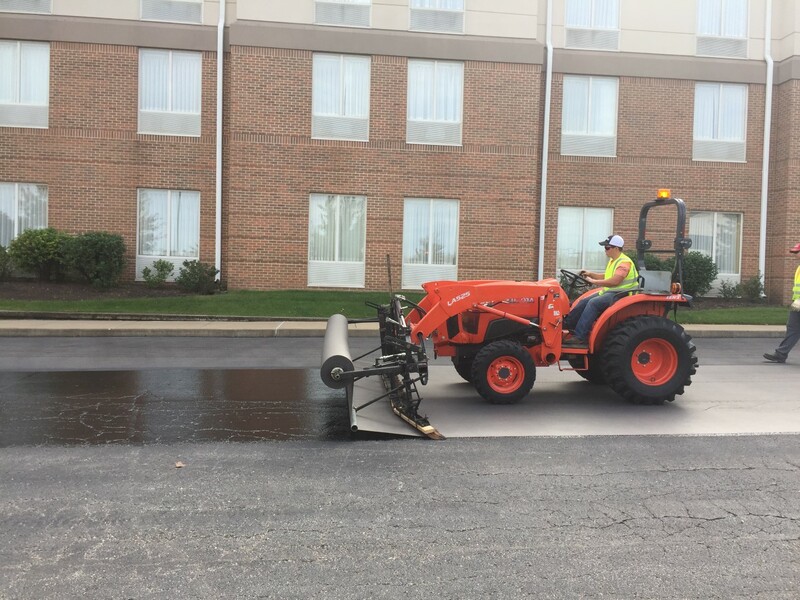 When placed between layers of AC pavement, these systems becomes an integral part of the roadway section, forming a barrier to water infiltration and absorbing stresses to reduce reflective and fatigue cracking of the new asphalt surface layer. 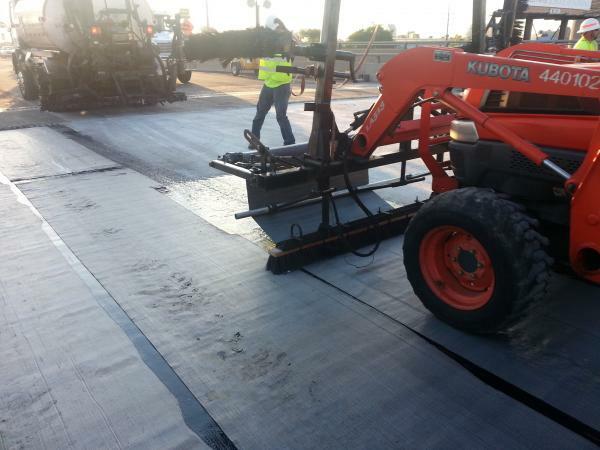 Missouri Petroleum Products has been installing paving fabric in the St Louis Region for more than 20 years. Our crew is professional, efficient and easy to work with. Contractors know that they can rely on us to provide quality installation at a fair price. Contact us for pricing and availability. They provide a Moisture Barrier to stop surface water from entering the road base. 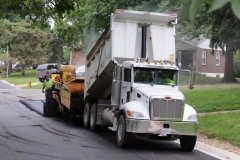 FHWA studies show that one-third to one-half of all precipitation falling on a road surface can infiltrate through the pavement to the base and sub grade. Pavement base materials that are saturated just 10% of the time can reduce the pavements life by 50%. They form a Stress Absorbing Membrane to increase pavement fatigue life and to retard reflective cracking. Laboratory tests indicate a 100 – 300% increase in fatigue life of a pavement when used with a Fabric Interlayer. Field performance indicates a 50 – 100% delay in reflective cracking occurs with a Fabric Interlayer. Fabric Interlayers are shown to be equivalent to placing an additional 0.1 to 0.15 feet (three to four centimeters) of ACC overlay in terms of retarding crack reflection. The installation of a Fabric Interlayer System is much less expensive than placing additional asphalt or increasing roadway maintenance. Use of paving fabrics generally yields a savings in pavement rehabilitation system costs of more than $7000 per lane mile. A needle-punched nonwoven fabric weighing a minimum of 4.1 oz. 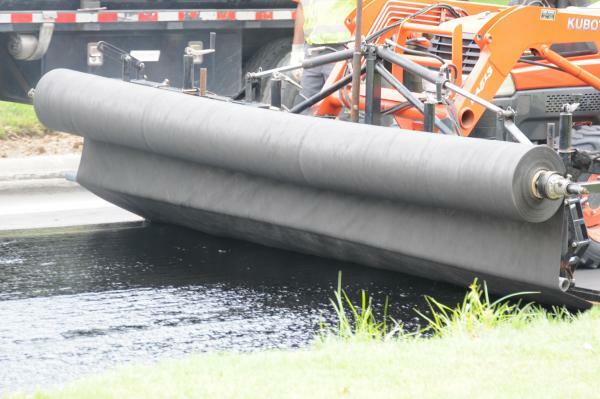 per square yard (meets AASHTO M 288), which, when embedded in a field applied asphalt cement tack coat (typically PG 64-22) becomes an asphalt saturated fabric membrane. Properly installed it is a pavement moisture barrier and a stress absorbing interlayer which retards crack reflection and extends pavement life. It is then covered with an asphalt concrete overlay or a surface maintenance treatment such as chip or cape seal. Paving fabric is millable and recyclable. Polypropylene Paving Fabric is also available in 4.6 oz/sy style. A wet-formed nonwoven hybrid of fiberglass and polyester fibers constructed to a nominal 4.0 oz. 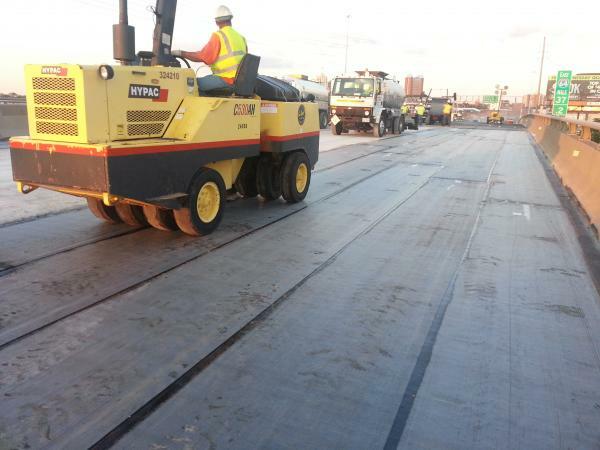 per square yard dimensionally stable mat, engineered for use as an interlayer for asphalt paving (meets ASTM D 5035). Paving mat is stable up to 495 degrees Fahrenheit to withstand elevated paving temperatures. 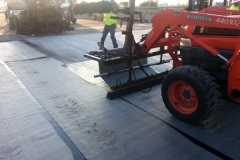 When installed per manufacturers specifications in a field applied hot AC tack coat (typically PG 64-22), the paving mat becomes an asphalt saturated membrane that provides an effective moisture barrier. In the pavement structure the paving mat provides low elongation, high immediate low strain tensile strength to retard crack reflection and extend pavement service life. Paving mat is designed to mill easily and recycle completely. When possible it is recommended to stop milling above the interlayer system to retain the benefits of the waterproofing interlayer, or mill completely through the fabric elevation rather than mill exactly at the fabric interlayer whenever possible. Non Waterproofing Grid – A high modulus grid installed onto an existing pavement using a pressure sensitive adhesive on the grid or using a lightweight carrier fabric which is adhered to the pavement with an amount of AC tack coat that does not create a moisture barrier. 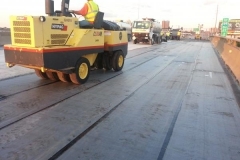 When the asphalt concrete overlay is placed over it, the grid embeds into and interacts with the overlay to provide tensile and torsional reinforcement to stabilize and strengthen the overlay. Grids are currently made in at least 2 different strengths. Waterproofing Composite Grid – A composite of a high modulus grid and a paving fabric (usually a 4.1 oz/sy AASHTOO M288 fabric) laminated in a manufacturing plant prior to shipment to the field. 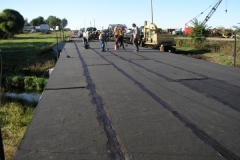 When installed, fabric side down over a field applied asphalt cement tack coat, the paving fabric side provides the moisture barrier and stress absorption functions while the grid top side imbeds into the asphalt concrete overlay to provide tensile and torsional reinforcement to stabilize and strengthen the overlay. Waterproofing Grids are currently made in at least two different strengths. 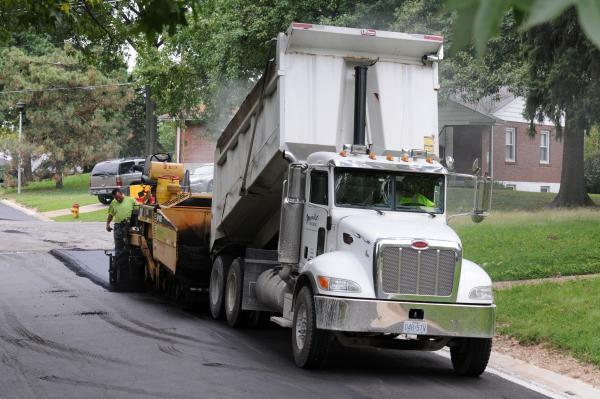 Medium Duty – A composite of a paving fabric, factory pre-coated with rubberized asphalt cement with an adhesive additive to bond the membrane to the pavement. 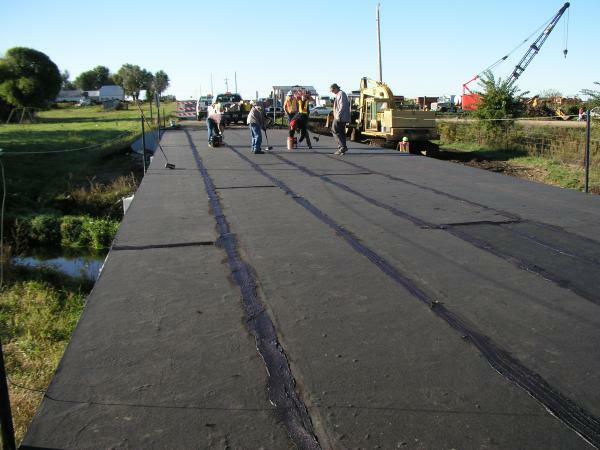 Applied as strips (typically comes in 12”, 24” and 48” wide strips) over local pavement joints and cracks or full width on bridge decks, and then covered with asphalt concrete to provide the functions of moisture barrier and stress absorption. This system is also widely approved as a bridge deck membrane. Heavy Duty – A composite of a paving fabric, a layer of asphalt cement with additives in the middle, and a layer of a high strength woven fabric applied as a strip treatment (typically comes in 12”, 24” and 48” wide strips) over an asphalt cement tack coat, paving fabric side down, on pavement joints and cracks under an asphalt concrete overlay to provide the functions of stress absorption, stress transfer, and moisture barrier. View more information on the Strip Membrane Interlayers we carry here. The information provided on this web site is provided on an “as is” and “as available” basis without warranties of any kind, either express or implied.